Mecwins is participating in the next NanoBio&Med2018 to be held in November 20-22nd in Barcelona (Spain). Our CEO Dr. Óscar Ahumada will be one of the invited speakers, introducing latest news and innovations of Mecwins technology at the Industrial Forum. 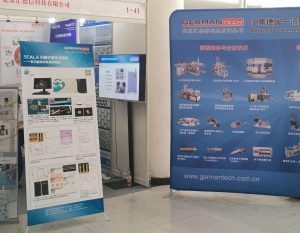 His talk titled “Detection of protein biomarkers at femtogram per milliliter levels using Mecwins technology” will introduce to the audience our ultra-sensitive and multiplexed protein biomarker detection technology. The NanoBio&Med conference is a perfect place to present the most recent international developments in the field of Nanobiotechnology and Nanomedicine. As organizers claim in the website of the conference “the discussion in recent advances, difficulties and breakthroughs will be at his higher level”. It will be our third year participating in the event so we can confirm such assertion. For over 30 years, Sensors Expo & Conference has established itself as North America’s premier event focused exclusively on sensors and sensor-integrated systems. Our General Manager, Dr. Oscar Ahumada, and our Business Development Manager, Rosalía Calleja, will travel to US to attend this conference. They will join people from MEMS industry and take the opportunity of being part of the ONLY event where you can find solutions for present sensing technologies while exploring sensing technologies that are driving tomorrow’s solutions. The event also includes an Expo Floor to see the latest sensing technologies. With over 250+ Exhibitors, we will have a great opportunity to learn about “hot” and cutting-edge technology areas: Energy Harvesting & Low Power, Flexibles & Printed Sensors, IoT, MEMS, Wireless, and Wearable Tech. Further information about the conference by clicking here. Our colleagues from Bioscience Department (Dr. Virginia Cebrián and Dr. Cristina Gómez Abad) and from Engineering Department (Dr. Andreas Thon and Dr. Valerio Pini) will attend the next International Workshop on Nanomechanical Sensing to be held in Delft from 22nd to 24th of June. This 13th edition of the NMC conference focusses on interdisciplinary research related to nanoscale sensors. The workshop topics include: Instrumentation, Biological sensors, Chemical sensors, Theoretical modelling of sensors, Micro and nano fabrication, Optomechanics and Novel sensing platforms. The special focus in 2016 will be on nano mechanical instrumentation..
We are very pleased to participate in II Peptide Materials for Biomedicine and Nanotechnology (PepMat 2016). This is an international conference dedicated to the most relevant developments in the field of peptide materials and its application to Biomedicine and Nanotechnology. 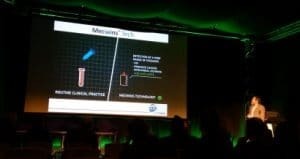 The conference was held from 14 to 16 of March in Barcelona and our General Manager, Dr. Oscar Ahumada, has participated with an oral presentation entitled “Mecwins: developing biomedicine applications using nanomechanical sensors”. 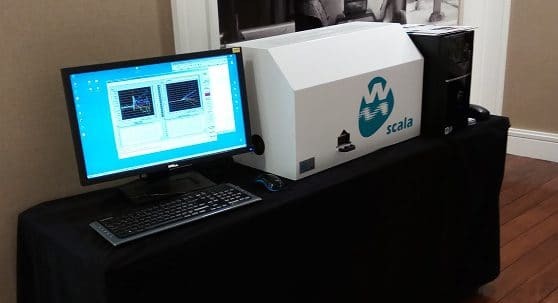 After his talk, participants took the opportunity of see our platform SCALA working, which as exhibited during the second day of the congress. We would like to thank to all the friendly people we met during the conference and specially thanks to Prof. Carlos Alemán for his hospitality and invitation to this congress. 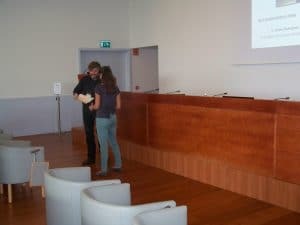 This sponsorship can be the beginning of new connections, relationships and developments of final applications in the field of peptides with SCALA.